Many passionate traders, both professional and private, use the NanoTrader platform. The trading store was created to allow these traders to sell trading tools and strategies to other NanoTrader users. You can buy and sell trading tools and strategies in a fully automated way. Programmers are supported by us. Tools and strategies are verified by us before acceptance in the store. Tools and strategies are automatically activated in the platform. Each tool or strategy comes with a detailed description and examples. Nearly all tools and strategies can be made without programming. Nevertheless an easy programming language called Express is provided. Those who have some programming experience will get quickly to grips with it. A detailed manual and support videos are available. 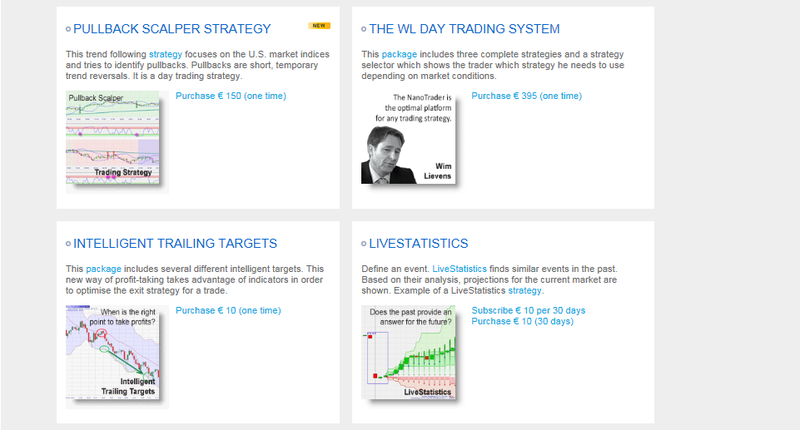 In the store both professional and private traders can sell their trading tools and strategies. Some of the tools and strategies are also offered for free. The seller can opt for a one-off fee or a monthly subscription. Some of the sellers even include on-line installation and coaching. This example shows a few of the tools and strategies available. Some of the sellers even include on-line installation and coaching! Also available for free in the trading store is very long historic data for the main markets. Long historic data can be used for rigourous backtesting and optimalising of trading strategies. 3. WHO IS IN THE STORE? Private individuals. Traders with some experience immediately see the value NanoTrader provides versus other trading platform. Because it is easy to make tools and strategies platform users can let their creativity run freely. Via the store these private traders can make their tools and strategies available to traders with a minimum of administrative complexity. WH SelfInvest. 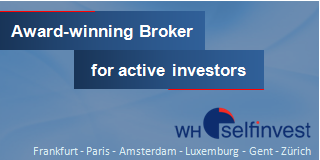 As the main broker proposing NanoTrader also provides free and paying items such as LiveStatistics and the unique and intriguing trailing targets. If you do not want to sell via the trading store, you can go your own way. Everything you make can be encrypted and/or time-limited and/or user-specific. You can, for example, provide to your buyers an encrypted strategy which can only be used by a specific user for a limited period of time.